Few people in DCU had as busy a summer as Amber Barrett. Between a move to a new college, a senior inter-county football campaign, a WNL league title to chase, a trip to Taiwan for the World University Games as national side captain, and a senior Ireland debut, Barrett has hardly had a minute over the past couple of months, but the Donegal native has settled in well to her new surroundings. “I think that I have been fairly well settled in since the big move to DCU”, she told The College View. “I’ve been very busy with placement and college work so I haven’t really had a minute to think about it. Plenty of change has come Barrett’s way recently, with the Milford woman having to leave the Donegal senior ladies panel to give other passions a chance. Barrett captains Peamount United of the Women’s National League – who are still chasing the league title late in the season, with little to split the Newcastle club and Wexford Youths with just a couple of games left. She was selected as one of the two captains for Ireland’s soccer representatives at this year’s World University Games in Taiwan, and recently made her Ireland senior debut in a 2-0 World Cup Qualifier victory over Northern Ireland. Things can get tough trying to balance so much, but Barrett believes she’s over the worst now. “I gave up GAA during the summer to focus solely on the soccer”, she said. “The World University Games were coming up so I wanted to give myself the best opportunity to do well there. “It was obviously a decision that was difficult but I have no regrets, thankfully. “It is difficult at times to balance football and college work, especially as I am on placement everyday so I don’t have that much time to breathe, however I manage my time well and I am able to survive the combination of the two! “At times last year I would have been swamped with trying to play GAA soccer and study and probably didn’t look after myself properly in that regard, but it all has been good so far. “It was a massive honour pulling on the Irish jersey for the first time, something I dreamed about for years. The 21-year-old has been able to reap the rewards of a lengthy, at times gruelling, campaign, best exemplified by powering through to the end of the WNL Cup Final with bad cramp as her Peamount side unfortunately fell 5-4 on penalties to Shelbourne after a thoroughly thrilling 1-1 draw over 120 well-matched, entertaining minutes. That weekend is remembered as a triumph for women’s sport in Ireland as the All-Ireland Ladies Football final set a stunning new attendance record and Dublin and Mayo more than lived up to the occasion – but just an hour down the road at Jackson Park, a farce ensued as a WNL game betwen UCD and Kilkenny United was forced into cancellation due to no match officials turning up. It was an unfortunate coincidence for the two incidents to happen on the same day – and it led to a lot of outrage on social media – and an embarrassment for the league, which has worked hard to build a respectable reputatio since the inaugural campaign in 2011. But it’s a situation Barrett, last season’s top scorer, is adamant won’t be repeated. “It was a disappointing thing to happen because the WNL has improved and still is improving”, she commented. “Without doubt the WNL is improving all the time, the standard of players is getting better each year and the average age of all the squads is as low as you would get. “The players are more competitive which allows the league to be and there is a huge competition every year for the title. “Look, it obviously was a simple breakdown of communication somewhere down the line, and that’s life. 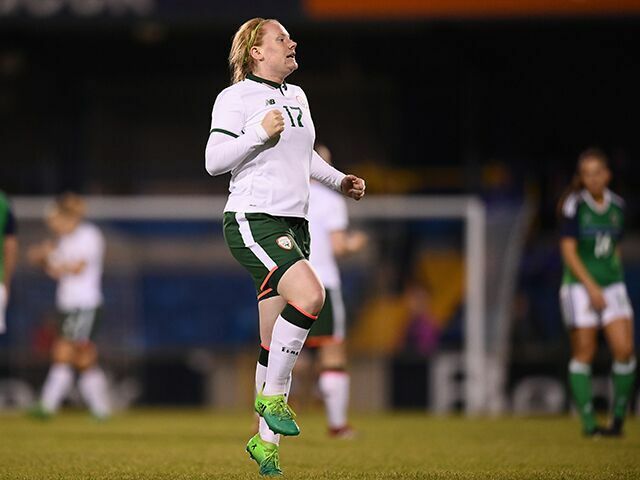 But for herself, the confident Barrett hopes to fulfil a few dreams of her own over this coming year with the Ireland team, with Peamount, and with DCU. “We’re in an extremely good position with Peamount at the moment in the league and hoping that we can push on for the last few games and take the title”, she stated. “It’s going to be a battle but I believe we will be ready. “I will be hoping to push DCU to become a successful footballing team as there is huge number of quality players now in DCU. “For me, personally, I am working to be included in the next World Cup qualifying game versuss Slovakia, which is another massive game for the team.